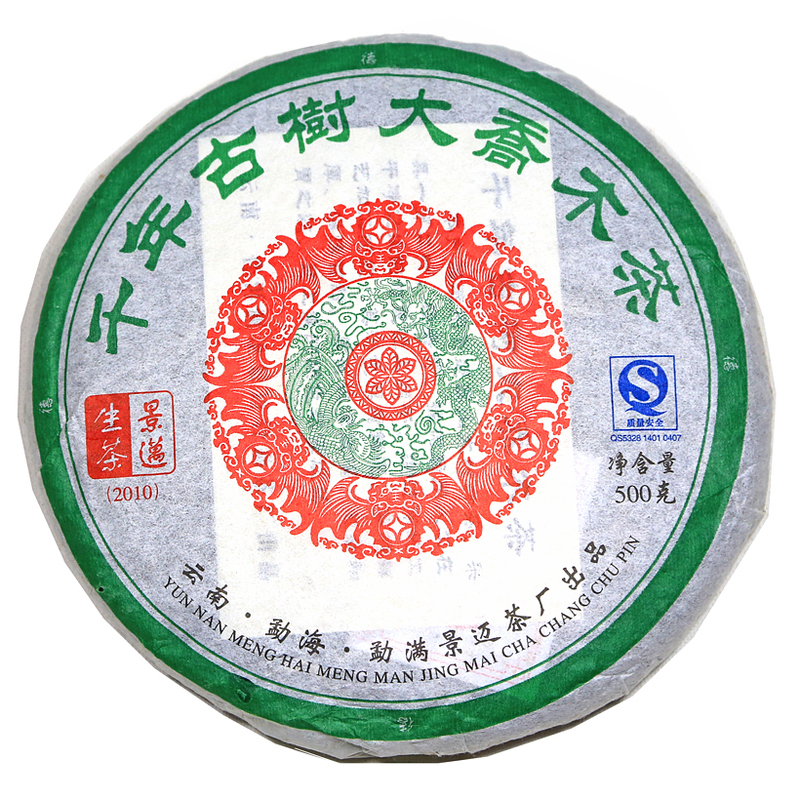 Mao cha is considered both finished tea and half-made tea. It is essentially young sheng Pu-erh and is drunk by villagers in Yunnan as well as being the leaf that all forms of Pu-erh are made from. Mao cha is simple to manufacture but is complex in its diversity. Mao cha can be made from the fresh leaf of one tea garden or be a blend of leaf from an entire tea village or from several tea producing villages within one county. Mao cha can be stored and aged after it is made, or it can be a new blend that is comprised of aged mao cha from different years. It is found in a variety of leaf sizes, too, depending on the location of the tea trees and on the type of local cultivars (size of the leaf) the mao cha was made from. Mao cha is a great example of the effects of terroir. As you can see, the possibilities and resulting flavors of mao cha are almost endless. All of these variables result in a staggering choice of mao cha for Pu-erh producers to work with. This sheng Pu-erh is pressed from the leaf of old tea trees ( qiao mu – tall trees or arbor trees, generally used for trees that are more than 100-years old) that was plucked in Da Zhai Jingmai village, the largest and most important village in this region. Old tea trees are quite common in this part of Jingmai. Here, one finds tea trees of many different ages, from 700-800 years of age, 300-400 years of age, and others simply noted as being over 100-years old. The forests offer a diversity of plant and animal life. All sizes of tea trees are found here – small leaf, middle leaf and big leaf varieties completing the rich environment of this tea harvesting area. This pluck consisted of a first pluck of a bud and one leaf and a later pluck of a bud and two leaves. The tea has a velvety mouth-feel and is round and harmonious in style. The taste is rich and deep and full with tones of flowers and honey. The taste is balanced, strong, the bitterness is pleasant and quickly transforms to sweet aftertaste. The tea liquor is pleasantly sweet. The wrapper on this sheng Pu-erh is particularly interesting. It is decorated with a circle of bats in red ink. Often depicted in red, a color of joy, bats represent “good fortune” in traditional Chinese culture. Sheng Pu-erh is also known as ‘un-cooked’ or ‘raw’ Pu-erh. It is the un-fermented version of Pu-erh. Sheng Pu-erh is un-fermented tea when it is young but microbial activity on the leaf will allow the tea to slowly ferment over time when the tea is kept under good storage conditions. Sheng Pu-erh can be drunk now or stored for years to allow this slow microbial transformation of the tea to turn the tea into something rich and full. Similar to young wines that will, over time, transform into much more substantial wines, Sheng Pu-erh is prized by collectors and tea enthusiasts for this ability to age and improve over time.